The measure of a donut place, in my opinion, is the cruller. This is the central failing of Krispy Kreme, the glory of Tim Hortons, and the sole redeeming characteristic of Dunkin. If you can do a cruller well, if you can balance the ethereally light with the deep fried and decadently sweet, you've got something right. 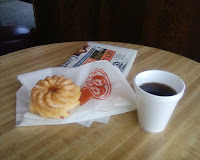 Chuck's Donuts, in Belmont, has nailed the cruller. This was a good thing, since my trip out to the bay area was not off to a great start. For one thing, it's a Sunday to Friday week on the road, with a red-eye on the return flight. Far too much time away from the Austin clan. The flights out here were long and arduous, my rental car was out of gas from the get go with it's low tire pressure warning blaring, and my hotel reservations were lost. The luck continued into the pre-Chuck's food experiences - I ventured out to find Lorenzo's Sandwich shop in Belmont for dinner (it was closed), checked out menus for a few places (weak) and after some wandering, ended up ordering a local, but sub-par pizza back at the hotel (Toto's is not all it's cracked up to be). But this part of the country is beautiful, and makes it hard to stay mopey for long. I woke up this morning committed to finding something good. 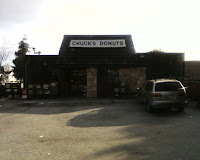 I'd passed Chuck's on my drive yesterday and decided it looked promising. Immediately on walking in, you know you're in for some serious goodness. The place looks like it's been there 50 years, with worn paneling on the walls and 4 little tables attached the floor and each surrounded by 4 miniature bar stools, also attached. The effect is that the tables and chairs appear to have organically sprouted from the floor, like mushrooms. Off the the side is a window into the kitchen, which seemed low tech and in some disarray, but clean. 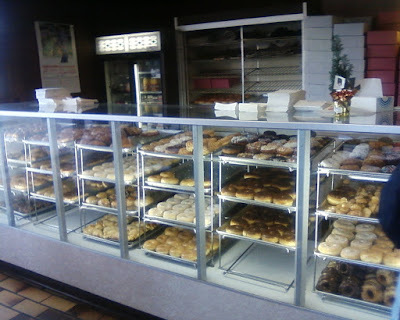 But the main view walking into Chuck's is this almost obscenely voluptuous display of donuts. And, just like that, this has been a good day. I've got a lot of work yet to get through tonight, but for the moment, I'm happily typing away in a quirky little San Mateo Coffee Shop called Bean Trees and looking forward to finding something tasty and cheap for dinner in the immediate vicinity. Tomorrow, I'm going for the sprinkles.